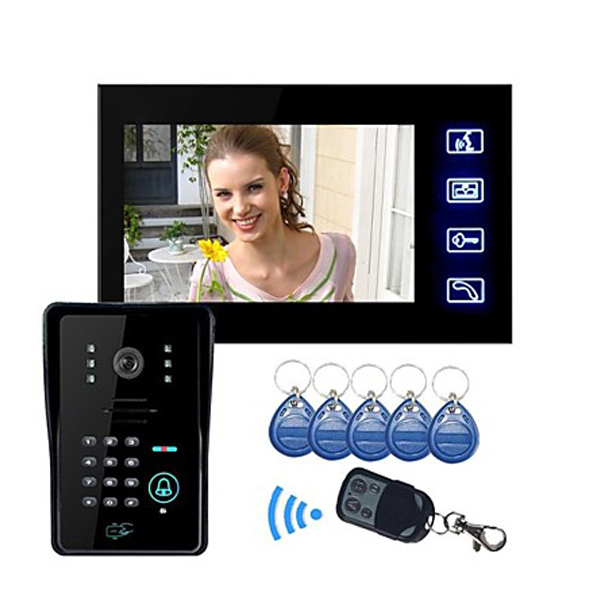 Successfully Added Video Door Phone - 7 Inch Screen, 500 ID Cards Support, Comes With 5 ID Cards, 5-10 Meter Remote Unlocking to your Shopping Cart. This 7 inch TFT video door phone supports up to 500 ID cards and is a great solution for small businesses and shared offices. With convenient wireless control, hands free unlocking and weatherproof rating, it will save you lots of trouble and help increase security. If you are a small business owner, work in a shared office or simply have a mid-sized facility with lots of coming and going to look after, this 7 inch TFT wireless door phone will be the answer to all your problems. With the support of 500 ID cards, you will be able to have all your co-workers enter the working area without the need for others to get interrupted to open the door. The door phone even comes with 5 ID cards - ready for you to use right away. Feel free to as many RFID-compatible cards as you need on top of that (up to 500). You will also be able to unlock the door with a password. The 7 inch TFT screen provides a clear interface for you to see all your visitors. Thanks to 6 infrared LEDs, you will have a clear view even after dark. The door phone’s camera comes with a 92 degree angle and will show you all there is to see. You will be able to unlock the door wirelessly from the distance of 5 to 10 meters. The 7 inch Color Display Video Door Phone comes with a 12 months warranty, brought to you by the leader in electronic devices as well as wholesale door phones..